As the months are getting a slight chill, well up in the tropics is a slight chill, we turn towards the winter warmers and soup always comes to mind. 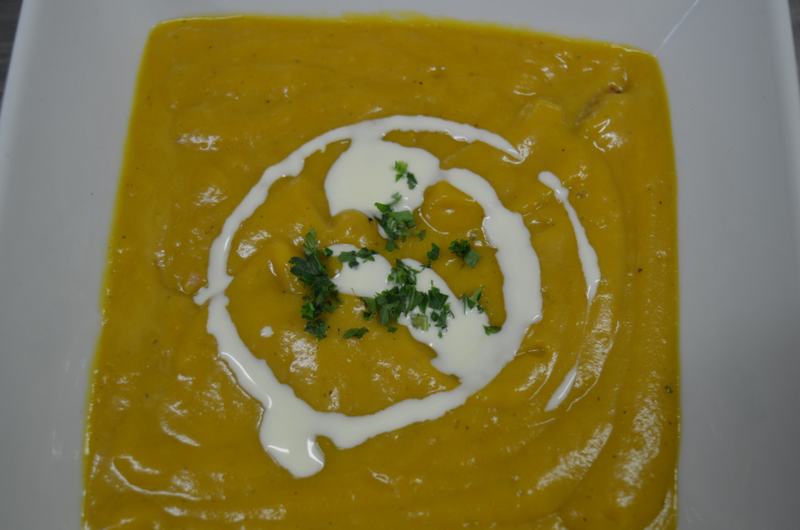 An all time Aussie favourite is pumpkin soup. The smooth, silky texture of this soup served with some warm crusty bread is a pure delight. It’s like a cuddle from the culinary world. With there amazing golden orange flesh and stunning greys, shiny green and yellow skins, they talk to me as I pass them by at the markets and green grocer. Not only to create so many wonderful dishes but as food art, a table centre piece. Food art, in its raw natural state can be just as stunning as a bunch of flowers. 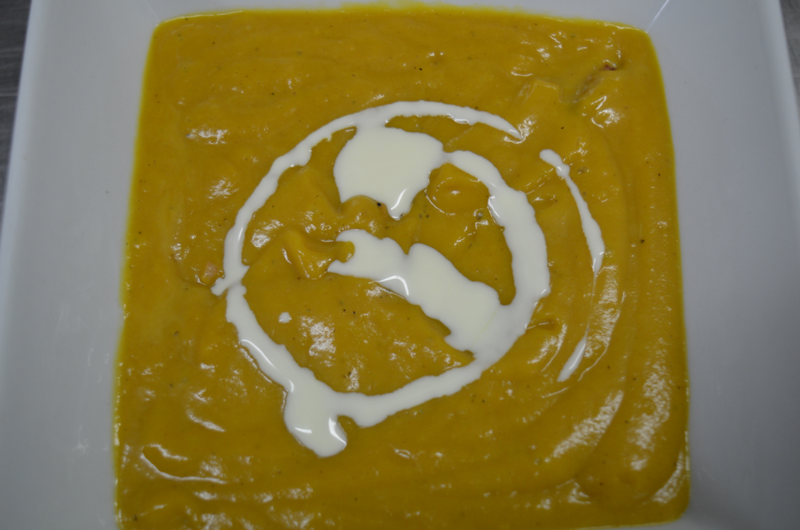 Pumpkin soup is an Australian staple, a mummy meal of the soup world. The sweet, earthy taste brings back so many childhood memories. A warming comfort food. I am a huge soup fan of all soups. There textures, consistency, whether it’s a clearer consommé, a vegetable puree drizzled with a swirl of cream, a noodle broth or grain studded bowl of hearty goodness. They all have a place in my kitchen and a warming tone to my belly. My market hunting and gathering can be, well it is, over indulgent. Such amazing produce and as much as I try not to, I do over buy. Can’t seem to fix this problem. When I see it, I want to play. So many dishes come to mind, so many amazing meals to produce, to experiment with. So as the weekend comes around and I need to make space in the fridge for this weeks hit. A pot of soup goes on. Starting with onions, then whatever hasn’t been consumed. Often some of my spice blends will go in, too spice up a little. Curry powder being the favourite at the moment but Ras el hangout, Jamaican jerk and Persian all get a look in. Every week changes as the produce comes and goes. Some soups are pureed, some hearty chunky styles. It is a fantastic weekly treat and one I truly recommend. Healthy, filling and warming... so lets get soup making! 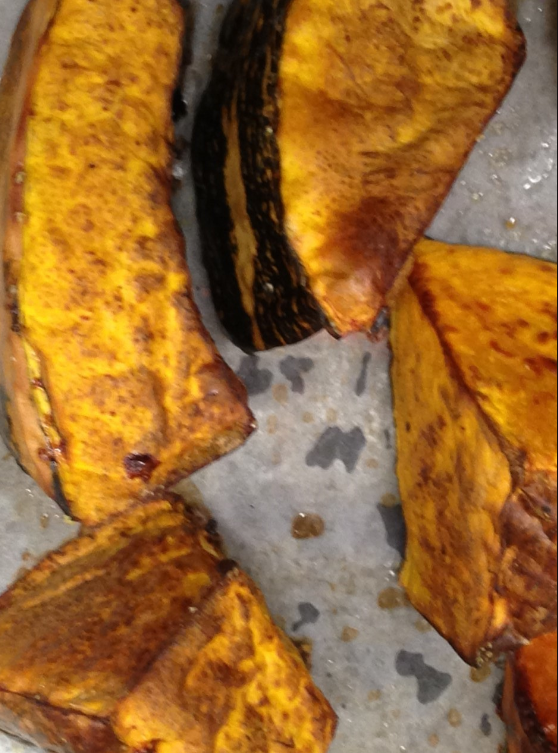 Place chopped pumpkin on roasting tray with 1 teaspoon of oil and dusting of salt and pepper. Mix with hands to ensure pumpkin is covered with the oil and seasoning. Roast till just tender. In a large saucepan place onion and 1 tsp oil. Sauté and add the leek. You don’t want any colour on the onions and leek, just cook till soft. Add the potato and stock and bay leaves. Bring to the boil and simmer until the potato is cooked. If making your own chicken stock, use roasted bones, way more flavour. Brought cooked chooks are fab for this. If you want to go a little Asian, add ginger and lemon grass to the stock. Other flavours like herbs, pesto, spices, sour cream, citrus, cheeses and oils can be add to change the taste. If you’re not suretake a little soup out and add the desired flavouring, taste and if it works for you, go for it. Blue Costello cheese works for me. Play around with different croutons. Herb, cheese, tapenade, pesto or spiced can add an excellent touch. Serve in little tea cups as a canapé. Made too much, can be used as a pasta sauce. Add some roast chicken, meatballs, prawns or anything really and stir through pasta. Sliced sauté onions and other vegetables will give it a bit more body. Crispy bacon sprinkled on top of your pumpkin soup looks great and taste wonderful little crunchy salty bursts of flavour. Stud the pumpkin soup with green peas. A sweet textural burst, even the peas and bacon together works a treat. Swap the potato for sweet potato, roast it too for a sweeter style soup. This is a base for many vegetable soups. Change the pumpkin to what you have. Nutmeg and pumpkin are great buddies, grate fresh if you can. A different take is to add red curry paste to the onions and use coconut milk instead of cream. Crispy shallots are another fabulous garnish. Crunchy little delights. Add some horseradish or mustard to the soup to make a lovely sauce for Atlantic salmon. This soup poured over feta, ricotta and bacon stuffed cannelloni is fabulous. Sautéed leeks, and onions, add little diced garlic and the bacon. Mix with feta, ricotta, little basil and seasoning. Use fresh lasagna sheets and roll. Place some soup in the base of the baking tray. Place the rolled cannelloni. Cover with ladles of soup. Lightly drizzle cream on top, cover with foil and bake around 30 minutes, then remove foil topped with grated cheese and grill. The joy of food, it never stops giving.